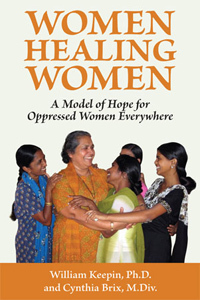 Women Healing Women is brimming with stories of women healing other women who have been oppressed by social conditions of extreme patriarchal injustice. Written in a narrative style, the book tells the story of Maher, a center for battered and destitute women and children in India. Founded in 1997 by Sister Lucy Kurien, the project has provided refuge to more than 1,400 women, half of whom would likely otherwise have been murdered, committed suicide, or starved to death. Maher’s doors are open to women of every religion and caste. It does not promote any one religion over the others, but instead lives in accordance with the universal divine Spirit that burns at the foundation of all the world’s religions. All scriptures are honored at Maher, yet none are taught to the exclusion of the others. Though originally founded as a refuge for battered women, Maher has grown to address a broad spectrum of interrelated social problems in an integral manner—including urgent social and economic needs within surrounding villages, ecological issues, and the needs of the tribal people and “Untouchables” in the region.